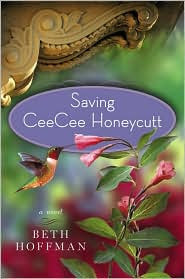 I'm so excited about the debut of Beth Hoffman's first novel, Saving CeeCee Honeycutt, that I'm launching the 2010 book giveaways with a special contest. Beth has been kind enough to give me two autographed first editions to give away here. You've heard me talk about this wonderful novel of a young girl and the women who embrace her. Now, you have the chance to win your own copy. It's very easy to enter. To enter, email me at Email me!. If that link doesn't work for you, the email address is: lholstine@yahoo.com. Your subject line should read Win "Saving CeeCee Honeycutt." Your message should include your mailing address. Entrants only in the U.S., please. The contest will end Thursday, Jan. 14 at 6 p.m. MT. Jim will draw the winners at that time. The winners will be notified, and the books will go out in the mail on Friday. Good luck! Great giveaway. One thing I was wondering, did Beth design the cover or someone else? It's a great cover and catches your eye and draws you in. Emailed you! :) Great contest! I've crossed everything from my eyes to my toes wishing for this one! Thanks for the chance, Lesa! Well, I doubt if it was Beth because I know authors seldom have any say in their cover design. The book says jacket design: Roseanne Serra. I'll check with Beth, though. Thanks, Crazy-For-Books, and good luck! Of course, I'm wishing everyone good luck, Gwendolyn. I wish everyone could win. And, if people don't, I hope they buy it or ask for their library to buy it. I've been reading lots of good things about this book - Maryellen has as well. Would love to have a chance to win. Count me in Lesa! You got it, Sally! I think she'll be doing an Authors @ The Teague for me in June (smile). What a wonderful giveaway! I had high expectations for this novel since it was compared to THE HELP, and I'm happy to say I enjoyed it as much as I had hoped! Ms. Hoffman wrote a remarkable first novel and your winners should feel very lucky. That's interesting that it was compared to The Help. I haven't had a chance to read that yet. Too many people on the waiting list. But, I'm going to get to it! I'm glad you enjoyed Saving CeeCee Honeycutt!